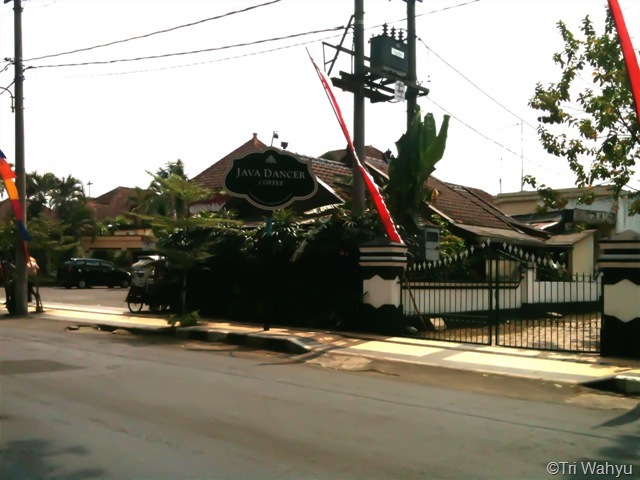 Java Dancer Coffee is one of iconic tourism spot in Malang as it’s location is at opposite direction of Malang railway station, Malang round square park and next to Tugu hotel. The area is one best example for preserve Dutch colonial architectures in Indonesia where traveler can experience glimpse of glory of the Dutch colonial era. Java Dancer Coffee has been famous place for traveler hang out who in middle traveling in Indonesia or in middle preparation either to go to Bromo mountain or Yogyakarta. You can spot different people from different nationality like Spanish, British, Australia, Canada, French, Dutch, German, Brazil and many more among locals who visit the cafe. 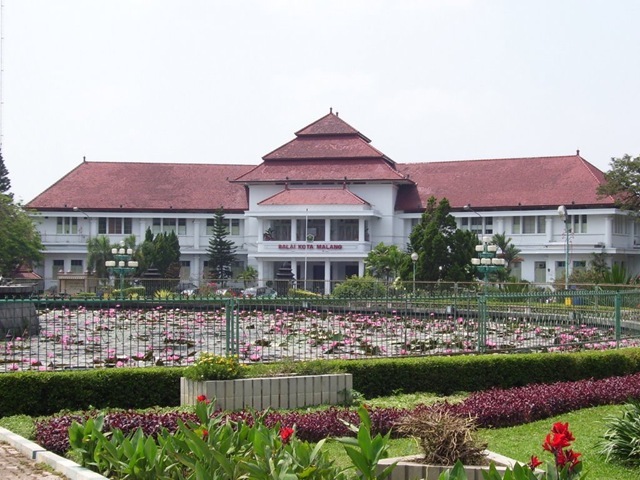 In addition of those place, there other hidden spot that famous in the area, such as, Malang bird market, Malang tempo Doeloe Museum, bakeries and old style restaurants. The cafe besides supported by excellent location also provide best selection of Indonesia’s coffee for customers who visit it. Traveler who want to enjoy a cup of Sumatera blue lintong or Sulawesi Toraja Kallosi or even further east Wamena arabica coffee can enjoy them and taste how different of this coffee beans can be at Java Dancer Coffee due the cafe sell them either as drinks or commercial beans. 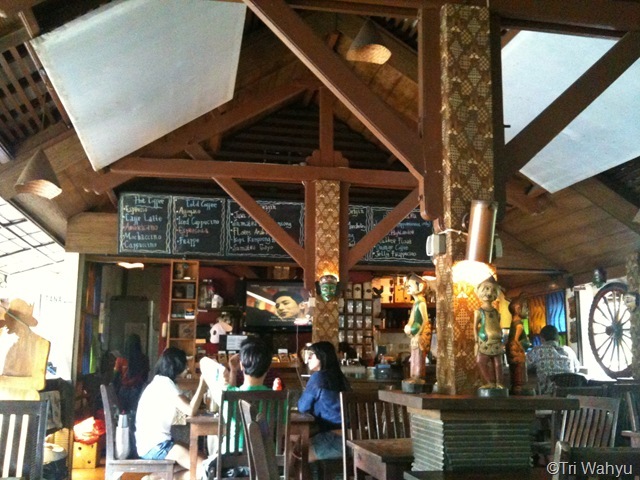 The cafe’s interior is dominated by Javanese decoration where brown wooden and rattan plaster surround the place. It’s has high ceiling and semi open cafe style where air can circulate through cafe so there no worry if someone smoke inside it. The high ceiling also help reflect light at night too so visitor don’t have to worry if he want read something at night. 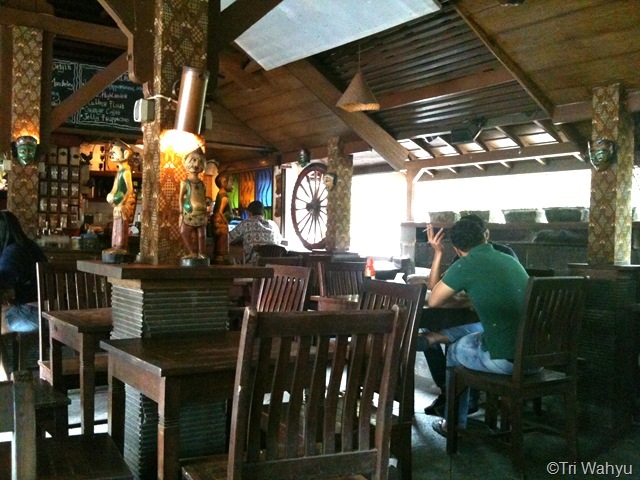 Java Dancer Coffee has wooden tables and chairs for it’s interior where it provides Indonesia traditional feeling for anyone who visit the place. Nevertheless, Java Dancer Coffee has several limitation that need to be noted by traveler who want to enjoy full experience of the place. 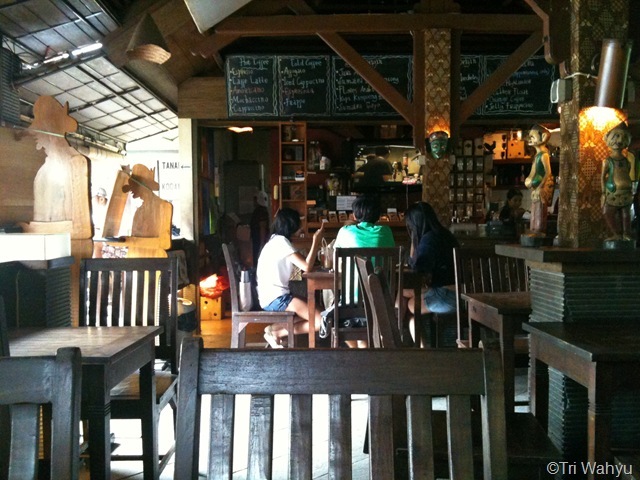 The cafe is only can accommodate between 30 or 40 people as there limited tables and seats for every visitors. The place can be crowded if there tour group visit the place in same time. 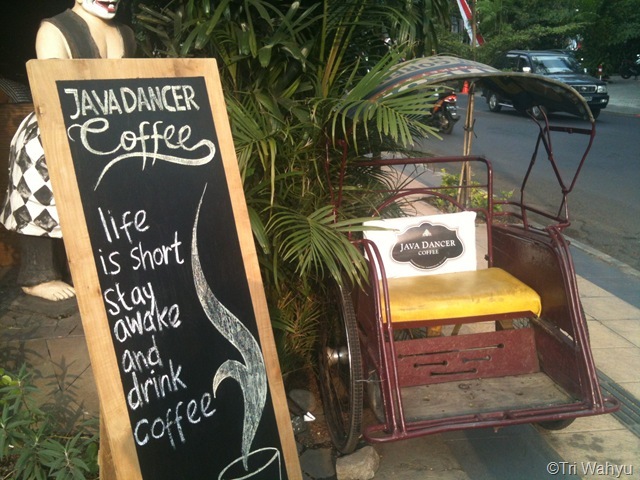 In addition, Java Dancer Coffee is located next to busy road where car and motorcycle noises can be distraction for anyone who want to quite and calm place for enjoying their coffee or read book. Particularly in morning or afternoon as locals going to work or return home. But, some visitors didn’t mind it and enjoy watched locals activities. There some ways to enjoy this place if you observe the area carefully. All you have to do is keep the place in your schedule as the last place you must visit before you rest for day. When you visit Java Dance Coffee you should forget your regular coffee drink, such as, espresso or cappuccino, as you cannot get full experience how Indonesia coffee through those drinks. The best coffee drink for experience it just a cup of hot coffee. Java Dancer Coffee provides at least 25 different beans from west to east Indonesia, include, Java Estate arabica, Sulawesi Kallosi arabica, Sumatera Blue Lintong arabica, Sumatera Gayo highland arabica, Sumatera Mandheling Arabica, Sumatera Sidikalang arabica, Flores Manggarai arabica, Wamena Papua arabica and even Kopi Kampoeng robusta. In addition, the place also provides three kind ages coffee beans where older green coffee beans have been kept for two or three years for better flavor before roasted. Its similar to wine process where wine keep it in cellar will produce better flavor and alcohol. There aged Java arabica, Sulawesi aged Kallosi arabica and Sumatera aged Madheling arabica. Those coffee are serve in three types serving as Toebroek (Indonesia hot black coffee serve) for Rp15000 IDR ($1.30 AUD) , in French Press/Plunger for Rp21000 IDR ($2.00 AUD) or in Siphon for Rp27000 IDR ($2.50 AUD). 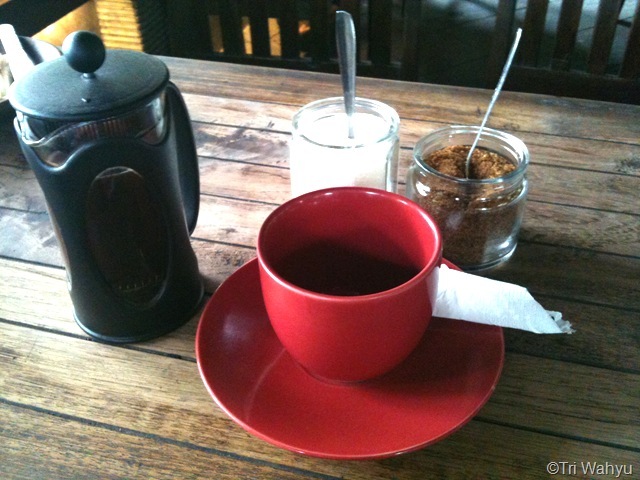 Meanwhile for aged coffee will cost around Rp21000 IDR ($2.00 AUD) up to Rp28000 IDR ($2.50 AUD). It still within budget traveler’s budget. Most importantly, Java Dancer Coffee also sells most famous and expensive Kopi Luwak or Civet coffee from three different places, include, Luwak Java arabica, Luwak Sumbawa robusta and Luwak Gayo arabica. Those coffee beans are seems already cleaned, screened and roasted for western consumers so you don’t need to worry about it’s taste. Those Kopi Luwak or Civet coffee are the most expensive serving as Toebroek for Rp80000 IDR ($7.50 AUD), in French Press/Plunger for Rp90000 IDR ($8.50 AUD) or in Siphon for Rp100000 IDR ($10.00 AUD). Meanwhile, Java Dancer Coffee is provides some selection of western snack, meals and desserts such as fried mozzarella stick, French fries, cheese balls, spaghetti meatball, pizza, turkey sandwich, beef burger, tiramisu cake, bread pudding, pancakes, waffle and toasted bread. Those cuisines are cost around Rp18000 IDR ($1.50 AUD) up to Rp56000 IDR ($5.50 AUD). 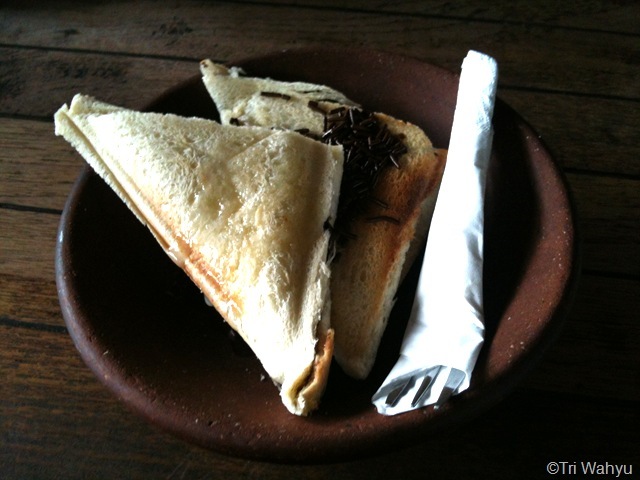 The toasted bread is serves in Indonesian breakfast style uses baked clay plate. Good companion when you enjoy a cup of coffee. 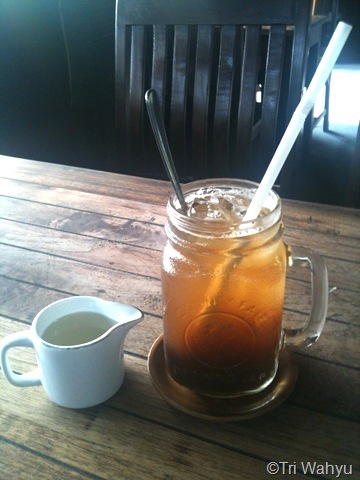 On other hand, the cafe also provides some good selection of western hot or ice coffee, soda and tea drink too. Those are include, espresso, cappuccino, flat white, cafe latte, ice cappuccino, espressoda, frappes, Affogatos, creamoreo chocolate, coffee cooler, Indonesian fruit juices, ice tea, macha frappe, green or white tea and lime tea. Those drinks are cost around Rp12000 IDR ($1.00 AUD) up to Rp 50000 IDR ($4.50 AUD). The espressoda is particularly strong one where it’s bitterness mixed sour lime extract can be ideal for keep someone stay awake until midnight. You can add simple syrup or sugar to minimize bitterness and sweetness it. A combination of strong bitterness and fresh experience. The best time to visit it is around evening or near midnight as traffic become less and only limited people who visit the place as locals already gone sleep at that time so you can meet other travelers in your leisure way. 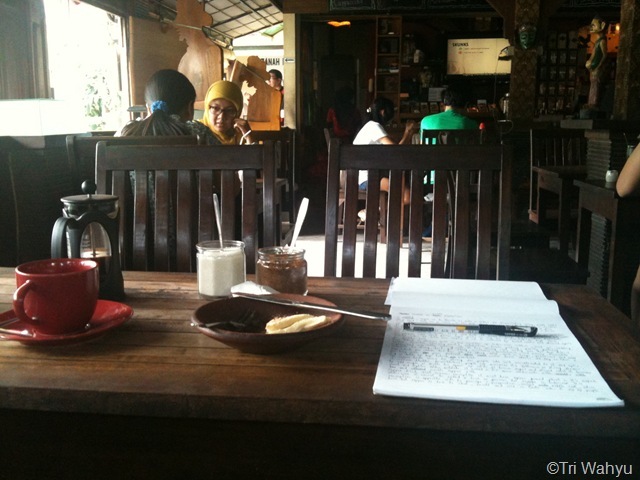 Its also best place for read book, find inspiration or write your travel journal for describe how your experience in Malang accompanied by hot coffee and light meal as night wind blowing chilled air around you. Its a blast after long travel. 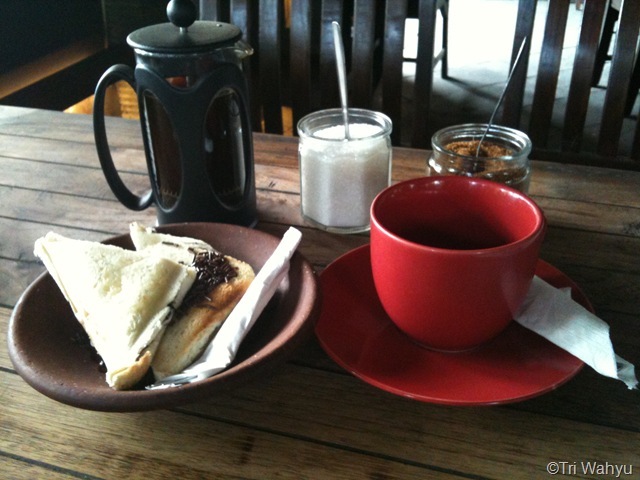 Tags: Beverage, cafe, Coffee, Coffee and Tea, coffee beans, Coffee culture, east java, Flat White, Food, Iced coffee, Indonesia, Java, java dancer coffee, Latte, malang, tourism, travel. Bookmark the permalink. espressoda with lime sounds very interesting! I wouldn’t have thought the two would mix! It’s bitter and fresh flavor give you strong aftertaste and good for anyone who pull an all nighter. You can add simple syrup or sugar water if you feel it too bitter. Java Dancer Coffee looks like a very comfortable place to enjoy coffee and conversation. It was a good place if you want to explore Indonesia coffee. A lot of travelers stop at the place when they visit the town. espressoda is particularly interesting. so it is actually made of espresso + soda + lime juice? this is my first time hearing or learning about a coffee beverage using a citrus added.